The Dyson Pure Cool air purifier has a bit of an unusual look - but rest assured: it works great. In fact, it works far better than most air purifiers. For example, removes 99.97% of allergens from indoor air, and its HEPA filters capture pollutants as small as 0.3 microns. This Dyson also comes with an activated carbon filter to reduce household odors and VOCs. 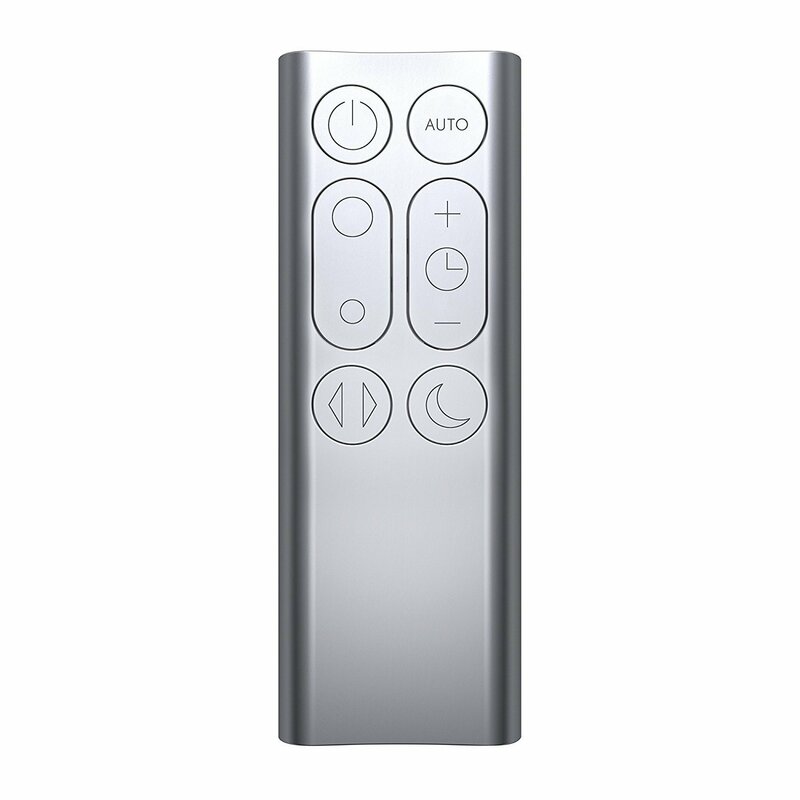 You control it using an included remote control or via the Dyson Link app where you can also view air quality reports. It’s also compatible with Alexa, if you want to control it by voice. The Pure Cool is certified friendly for asthma and allergy sufferers and has a Quiet Mark accreditation from the Noise Abatement Society (meaning it is super quiet). The pricing is a bit high compared with other single-room air purifiers, but many customers say it’s worth it. Read on for my full review of the Dyson Pure Cool air purifier. If you are looking for something less expensive with less stringent cleaning, see my HEPA air purifier buying guide for my latest recommendations. High performance air purification – highly recommended for those with asthma or allergies. 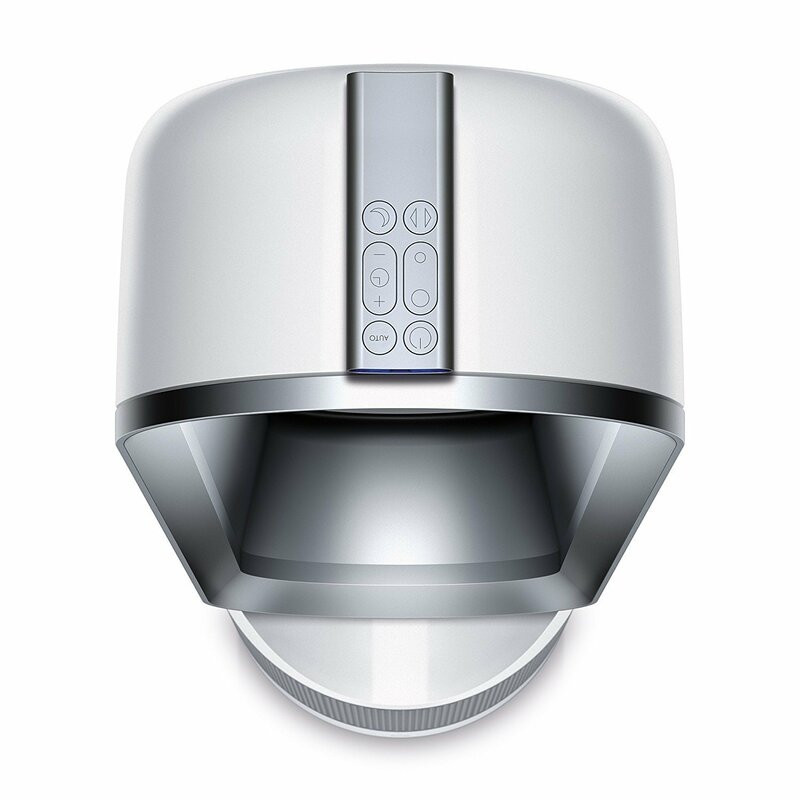 Multiple modes and settings including 10 fan speed levels, night mode and auto mode. WiFi connectivity – you can control it from an app or via Alexa. No exposed spinning blades – safe for little ones and pets. Doubles as an air conditioner in summer. The Dyson Pure Cool air purifier uses a different technology from what we are used to. Most air purifiers work by drawing air through a HEPA filter and then spreading the purified air around the room using fans. The Dyson Pure Cool works differently. One of the first things you’ll notice is that there are no visible fans; only a base and a loop-like tower on top. The fans are hidden in the base, where they force air to the top through small angled slits on the inside of the tower loop. The air comes out under pressure and blows forward. This creates an area of low pressure which causes air around the room to join the stream of air blowing towards you. That’s why the loop is called an air multiplier. Before it is released from the unit, air passes through a HEPA filter which captures pollutants as small as 0.3 microns. There is also an activated carbon filter to capture harmful VOCs and common household odors. 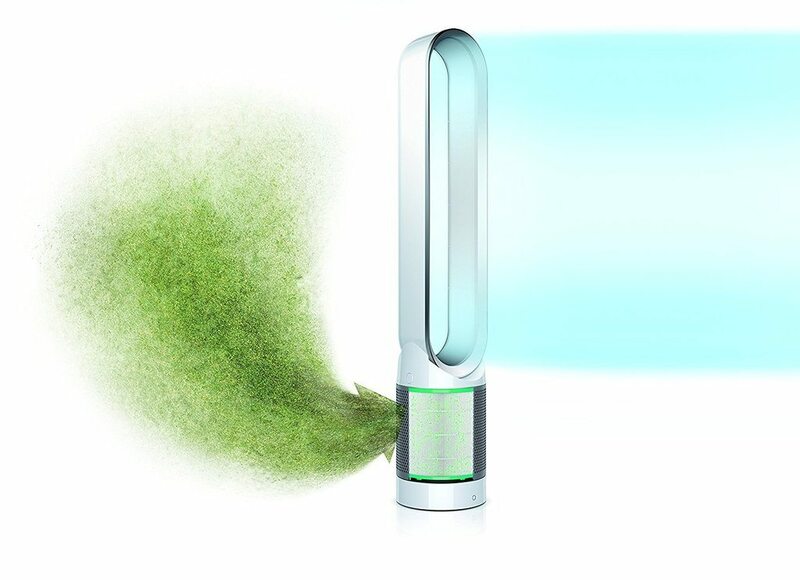 Overall, the Dyson Pure Cool eliminates 99.97% of allergens and pollutants from the air. And because of the high-performance air multiplier technology, it purifies far more air, more quickly, than conventional air purifiers. The air multiplier tower creates a strong cool airflow, much stronger than that of a desktop fan. 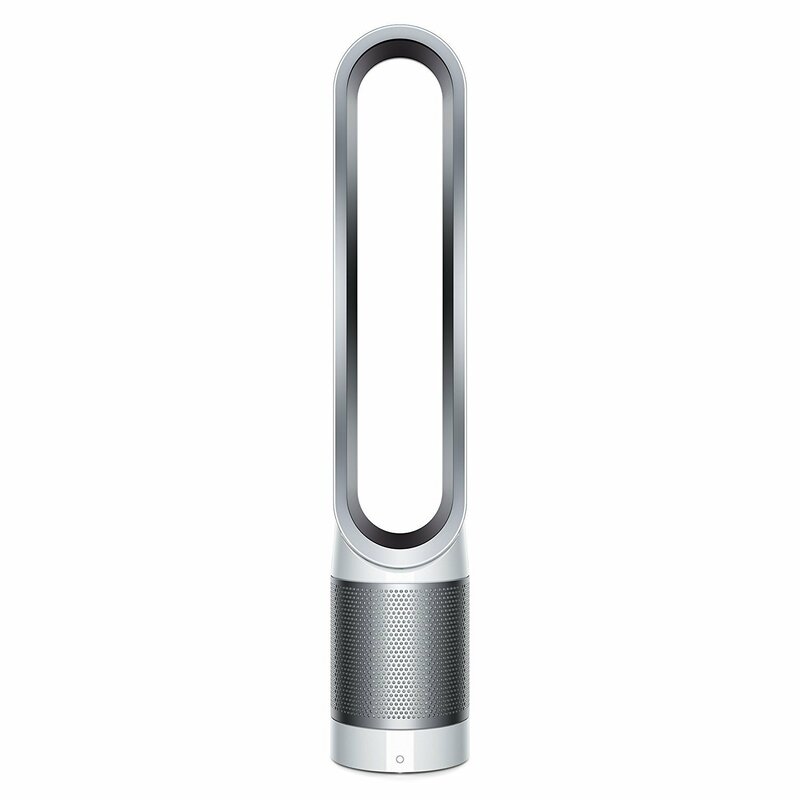 So in summer, rather than switch on that noisy fan you can just use the Dyson Pure Cool air purifier. It will keep the air clean while also producing a nice relaxing breeze. The Pure Cool air purifier has WiFi connectivity. It comes with a companion smartphone app for commanding the unit; or, you can connect it to Alexa if you want to use voice commands. During setup, the smartphone app will guide you through the process of connecting the air purifier to your WiFi network. The app is a bit cluttered and can be a bit challenging to use in the beginning. But once you get used to it, it’s really easy and surprisingly convenient - and informative. The most unique app feature is Dyson's air quality reports. I’ll talk about that shortly. You control your air purifier from the app or using controls on the unit. Options include changing operating modes, setting fan speed, control the timer and start, pause or stop the air purifier. To use Dyson Pure Cool Link with Alexa, you need to have an Amazon Echo device. You’ll also need the Alexa app installed on your phone - look for the Dyson skill on the Alexa Skills page on Amazon, and enable it. Once you link your Dyson and Alexa accounts, you are good to go. 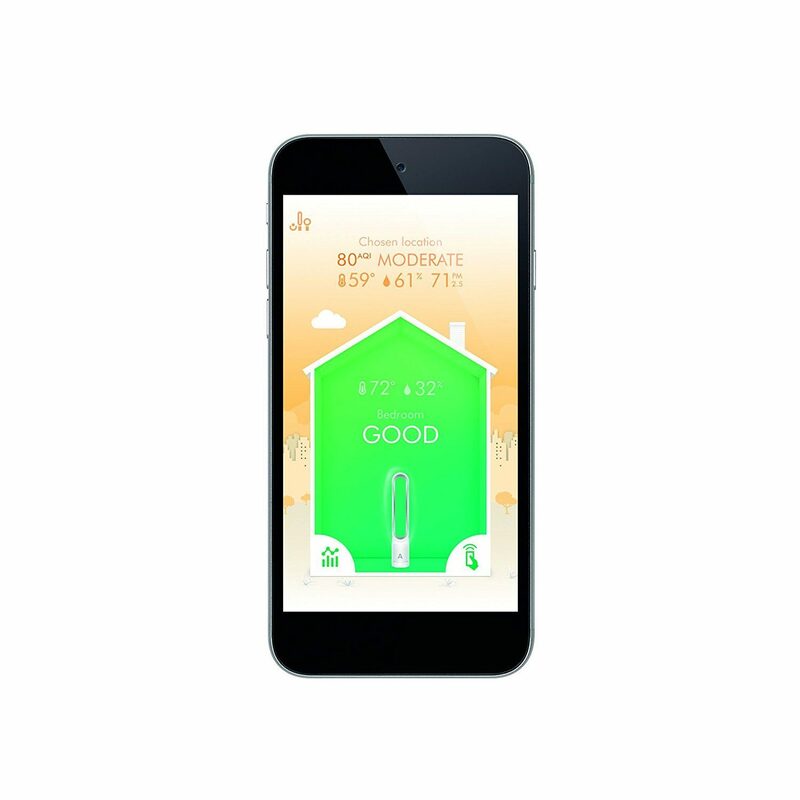 The Dyson Pure Cool constantly monitors the air quality inside your home and feeds a report to the Dyson Link app. In the app, you can view the current air quality status as well as air quality statistics from the past several days. It’s a great way of keeping track of your indoor environment. • 10 airspeed settings. You can lower speed to make the air purifier quieter or increase speed to boost performance or create a stronger breeze. • Oscillation on or off. Turning on oscillation enhances air purification and cooling. • Auto mode. The air purifier automatically selects the best settings depending on air quality and time of day. It can turn on night mode automatically. • Night mode. You can manually turn on night mode on the remote control or app. This lowers fan speed and dims the display. Most HEPA air purifiers cost less than $200. The Dyson Pure Cool Link costs almost $500. But given the technology included, the connectivity, the air quality reports and the wide range of operating modes, the price makes sense. 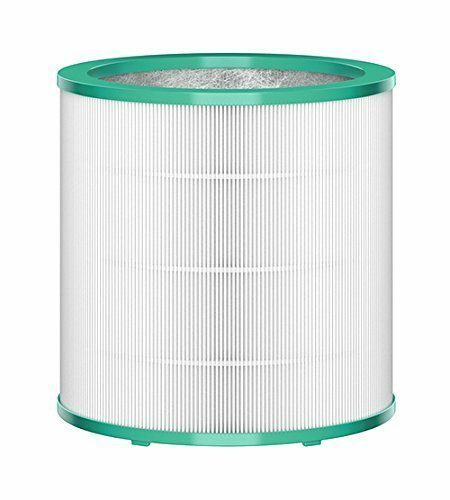 What does not make as much sense, however, is their expensive filter replacement pack which consists of a HEPA filter and an activated carbon filter. A replacement currently costs $62, which is a lot for an ordinary HEPA filter. Dyson says the filter replacement reminder will come on after 12 months. But some verified owners claim you will need to replace it more frequently than that, about 2 or 3 times a year depending on your home’s air quality and for how many hours a day the air purifier is on. So if you use this air purifier often, you may spend quite a bit on replacements. While unusual in design and a bit pricey, the Dyson Pure Cool Link air purifier is one of the best air filters available right now for removing allergens, pollutants and smells from your household - and, as a bonus, provides a nice degree of cooling when it’s hot. This is a great choice for those with respiratory problems or who need a high-performance air purifier. It is also a great choice for anyone who needs a remote-control air purifier or air quality analytics.